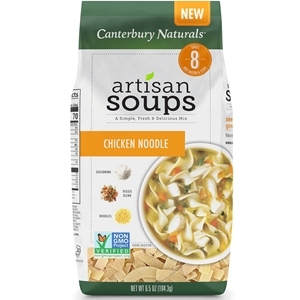 Canterbury Naturals Chicken Noodle Soup tastes just like the warm comforting soup we all love. Tender chicken is cooked in a savory broth full of carrots, onions and celery, loaded with luscious noodles. 1. Combine water, chicken stock and vegetable packet in a stock pot. Bring to a boil, reduce heat, cover and simmer for 20 minutes. 2. Add noodles and chicken, return to a simmer, cover and simmer for additional 10 minutes. 3. Combine seasoning packet with 2 tbsp. cold water. Stir with a fork until smooth. Add to soup while stirring, cover and simmer for an additional 5 minutes, stirring occasionally. (Note: If using prepared chicken, add during the last 5 minutes of cook time). Pasta (Durum Semolina Wheat Flour, Niacin, Ferrous Sulfate (Iron), Thiamin Mononitrate, Riboflavin, Folic Acid), Seasoning Blend (Sea Salt, Corn Starch, Cane Sugar, Organic Whey, Maltodextrin, Onion, Yeast Extract, Garlic, Spices [Thyme, Celery Seed, White Pepper], Turmeric, Parsley), Vegetable Blend (Carrot, Onion, Celery, Parsley). Allergy Information: Contains: milk, wheat. Made on shared equipment that processes eggs, milk, soy, wheat and tree nuts. Best chicken noodle soup I have ever tasted. Goes great with a grilled cheese sandwich. When I first read in instruction for this soup I thought, "What a pain!" Simmer the vegetables, then add the noodles (and chicken) and simmer some more, add the spices and simmer even more. But, you know what? I think they are on to something. This is the best chicken noodle soup I have tried from SoupsOnline.com. It is flavorful, thick and rich; just like I prefer. It is also very filling. I plan to purchase this soup again and to try other products from Canterbury Naturals. To boost the flavor even more, next time I plan to add maybe 1/2 of a finely diced shallot and a clove of garlic. Doubleplus Yummm! My daughter loves this soup!